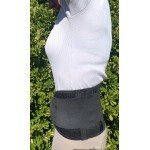 Applied Posture Riding prescribes braces for pain control, for posture support and for muscle support and stimulation. Back Pain is common in horse riders and wearing the correct brace is important. Poor posture and weak muscles are easily trained when working with the correct brace. 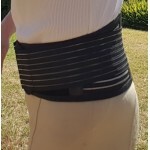 Anybody can wear this belt to aid your core function. Please note the tourmaline material does generate heat, wear it over clothes. Can be worn while riding and working. High impact absorbing air cells for even distribution of rider pressure. The Pad extends beyond each end of the saddle for even distribution. Ideal lightweight back Support for riding and light work. 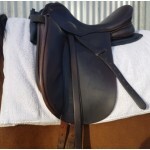 Best suited to riders with mild back pain. Warning do not wear directly against your skin. This is a gadget to help massage your neck to prevent tension build up and headaches. Sundown Naturals Vitamin E Skin Oil 70000ius 75ml Extreme Hydrating Night Oil. Tens Unit with 5 stick on Electrodes, foot electrode, and connection lead. Treat muscles and joint pain and increase circulation. Lightweight Support Knee Brace with Silicone for protection from rubbing. One Size XL Fit knee circumference 48-50cm upper thigh. Ideal to wear over your Jodphurs to prevent blisters or rubbing, turn sideways to add an extra stick to your saddle. Pull on Neoprene Brace for Patellar Support. 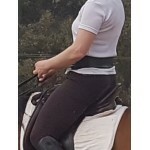 Wear over your Jodhpurs or under to support your patellar and prevent rubbing on your saddle. One Size XL Red silicone fits thigh circumference 45-48cm. (This brace will generate heat being neoprene). The brace is a one size fits all. The removable metal bar follows the contour of the palm and wrist. The bar can be bent more to fit your wrist comfort. The thumb goes through the thumb hole and the brace then wraps around on itself.